After waiting 17 years for a permit, I wasn't going small! I am a taxidermist so I shot, ate, mounted the head, tanned the hide. and made gun racks from the feet. 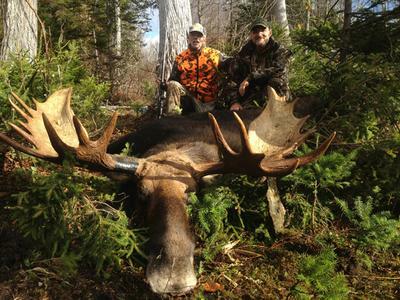 Nothing to waste on this Monster 57 Inch New Hampshire bull moose. 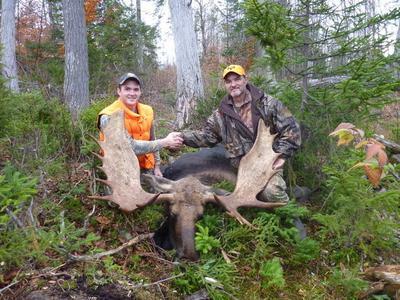 Took this bull in New Hampshire this past fall (2012). Had a nice 50 yard shot, and put it right thru the heart, he was down in 20 yards and done. 720 lbs dressed and sporting a 57 inch rack. Good for second best in the state this year(58 was biggest. Wow! That is a huge moose. Thanks for sharing that one. I've read that getting a draw for moose can take a long time. I didn't know it would take 17 years though! To enter the lottery it will cost you $15 if you live in New Hampshire. If you are a none resident the price goes up to $25. In 2012 over 13,400 hunter applied for one of 275 permits that were issued. That is not too great of odds 1:48 although the state offer hunter the chance to accumulate points if you enter consecutive years. If you had 9 points in 2012 your chances of being drawn were 1:17. Much better! You don't have to buy your hunting license before you enter the lottery but once drawn the New Hampshire moose hunter must but one. The resident hunter pays $150 while the non resident pays $500. 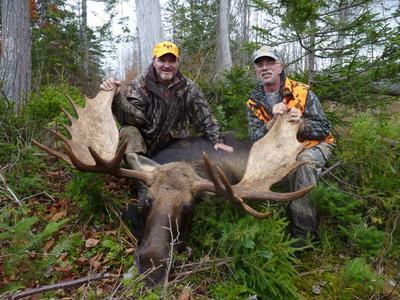 Moose hunting is relatively new to New Hampshire. The moose population had recovered enough that in 1988 the state issued 75 permits and they haven't look back. Having a sustainable harvest based on science rather than assumptions will ensure the moose hunt will continue for many years to come. Okay, so am I allowed to vote for my own Moose. This was the hunt of a lifetime for me. never know if youll get another tag. But...NH has some of the best chances of drawing a Moose permit, so keep trying. What a nice NH Bull.